It's Just Mobolaji | Music & Entertainment: A Night With Jazmine Sullivan @ KOKO, Camden – 30th March, 2014! 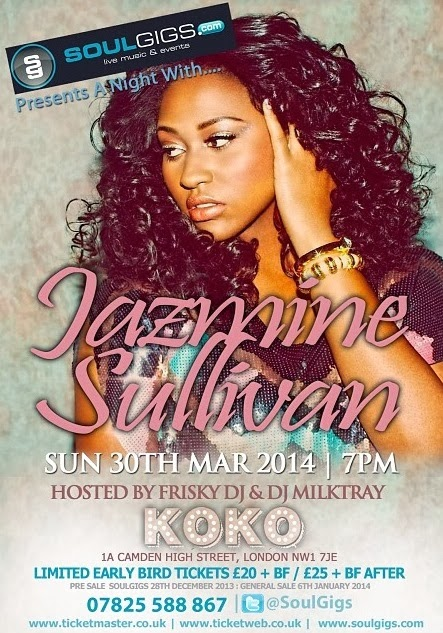 A Night With Jazmine Sullivan @ KOKO, Camden – 30th March, 2014! Jazmine Sullivan has one of the most exquisite voices in the business. Without a doubt the R&B/Soulful singer is undeniably talented, and is finally returning back to music. Sullivan released her sophomore album ‘Love Me Back’ in 2010 and in 2011 Sullivan took a break from music what was rumoured to be a retirement from music, but luckily enough for her fans - it was just a stand still from the industry. 2014 will see a highly anticipated return from Jazmine Sullivan who has been away for three years - no music, no appearances, or even a performance. We don't even know what she looks like now! Legendary UK based soul loving event promoters - Soul Gigs, will bring Jazmine with a one off show on March 30th at KoKo’s London will be her first public appearance and performance in 3 years. It's been a long time coming, but we finally get to hear her perform live! Further details about the event below! This show is an 18+ event, and tickets are currently on sale - priced at £22.50 (upwards) and can be purchased via TicketWeb! If you know what's good for you, you will not miss this show!